This article discusses whether the Space Mountain Roller Coaster at the Walt Disney World Resort in Bay Lake, Florida goes upside down or has a loop, corkscrew, or inversion. Also mentioned in this article are the Space Mountain rides at the other Walt Disney Company theme parks. The Space Mountain Loop, does it exist? Does Space Mountain go upside down? 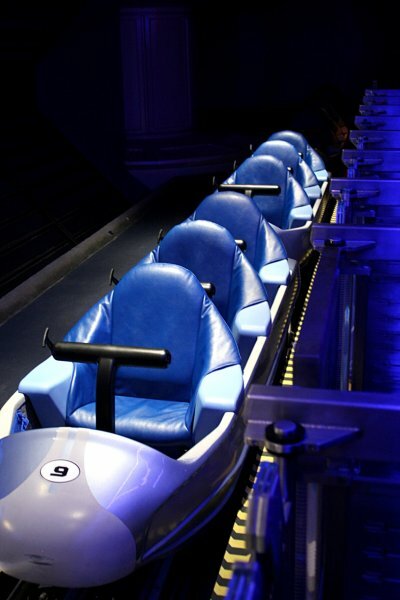 The Space Mountain ride in the Magic Kingdom theme park at Walt Disney World does not go upside down or have a loop during any part of the ride. There are no inversions or corkscrews that are part of the roller coaster's track. You do not go upside down on Space Mountain in the Magic Kingdom. There are also no upside down looping movements on Space Mountain that would make it seem that you are going upside down. The roller coaster starts off in the loading area and then proceeds to to the “launch area”. The roller coaster then takes passengers upward to the top of Space Mountain. From the top, the ride takes passengers back down to the bottom through a series of fast turns and drops. There are no “big drops”, on Space Mountain. More information on the drops can be found on this page that covers the drops. Once the ride reaches the bottom you are transported to the unloading area. The main part of the ride is mostly dark, however, stars, asteroids, meteors, comets and "space in general" are projected on the ceiling. By having no upside down portions on the ride, Space Mountain can be more appealing to a wide range of theme park attendees. If you do not like or are scared of loops, being upside down, or similar, Space Mountain could be the one roller coaster you can ride. Above photo of the Space Mountain Train Cars on our Upside Down Loop page by William M on Wikimedia Commons. Photo modified by NavFile. Image released under a Creative Commons License. Disneyland Paris has a version of Space Mountain called Star Wars Hyperspace Mountain, formerly Space Mountain: Mission 2 (Before 2017). Does space mountain at Disneyland Paris go upside down? Yes, that roller coaster does have upside down portions. This is the only Space Mountain attraction that takes you upside down. The ride has points where it makes inversions and goes upside down. The Space Mountain rides at Disneyland (California), Tokyo Disneyland, and Disneyland Hong Kong (Hyperspace Mountain) do not go upside down or have a loop. Coverage on the other Walt Disney Company theme parks and other Space Mountain rides may be added to the site at a latter date. To learn more about Space Mountain and the Magic Kingdom Theme park at Walt Disney World in Bay Lake / Orlando, Florida, visit the other pages here on the site.